We went aboard the Baglietto 34 m Revitality on a day with an overcast sky. Skipper Charles Manfredi had agreed to our request and we had the chance to savour the merits of this modern yacht in the Bay of Liguria. Range at 25 knots: 700 n.m.
Now the rotor beats out ten minutes of anxiety in dark, regular time (he'll be there, you know, he must have understood my English on the mobile.) and without time to worry about it the Apennines become coast, sea, Pegli, Voltri, Arenzano. There it is. Minuscule from this distance. Out of the Christopher Columbus airspace. Perfect. It's ten o'clock sharp. OK captain, everything as planned. Not exactly everything: the clouds. They're all over the north Tyrrhenian. Logic says they should be here too, low and compact, to ruin the session. Whereas they open up, a perfect mythological choreography, and a glorious ray of sunshine brings to life the blue and silver hull beginning its westward planing. Varazze is a few miles away, the yard where she was built, her home we might say. In the afternoon I'll be going to see the boat with the captain. 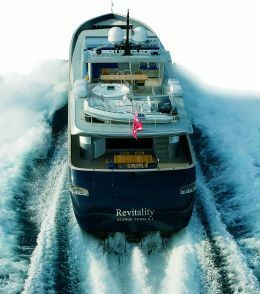 Revitality is a 34 metre yacht built by Baglietto. This old Ligurian shipyard's current production is distinguished by Fast Yachts, Hard Tops and Displacement vessels. We'll deal with the past later on. It would be hard to condense 152 years of history into anything less than a book! Revitality is obviously part of the Fast Yacht Line: semi- planing and planing hulls between 30 and 38 metres which to a greater or lesser extent take the lead from their family founder the Adler, launched in the late 80's and still much admired on the East Coast of the United States. 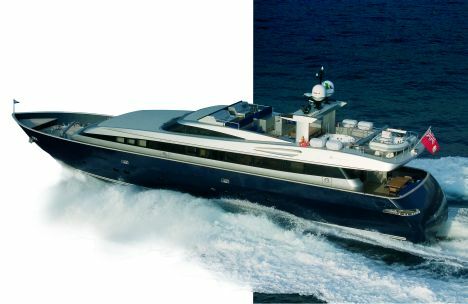 The evolution of lines and technologies - a result of the various designers who have worked for the yard - has not however affected the material of the hull: since 1970 the main material for the construction of these classic Fast Yachts, and the sportier Hard Tops where it is masterfully employed, has been aluminium. Where weight is not a problem - as for example in displacement hulls - they are built in steel with an alloy superstructure. Revitality, the ninth version of her class, which could be defined as planing with traditional trim adjusters (flaps) and immersed screws, reaches a top speed of 30 knots and a cruising speed of 27, powered by 2x2700 HP MTU engines. Similar in performance and external appearance to her sister ship, they differ in the internal layout. With every Baglietto the owner makes choices that are customised and interpreted by the architects, in this case Francesco Paszkowski who also did the exterior design. 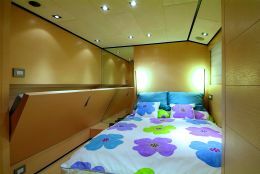 The result is an elegant motoryacht with contemporary, almost minimalist interiors where the straight, sharp lines of modern furnishings are matched with precious antique pieces. 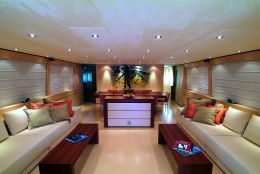 On the main deck, forward of the spacious cockpit that is sheltered by the flying bridge, the saloon is welcoming with large corner sofas face to face and unadorned walls; the spaces exploited lie at the sides of the steel and crystal entrance door. Almost uninterrupted glazing lengthens the perspective of the volumes and highlights, together with the light colours of the various woods, the luminosity and brightness of the ambience. The eye is drawn to the dining room which has a modern artwork in the background. The teak table and ten chairs are separated from the living area only by a low item of furniture where the TV stands. 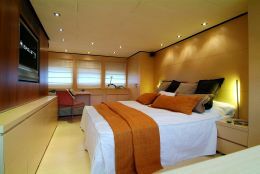 The same décor for the owner's cabin, again on the main deck, and certainly the same impression of light: a double bed facing a panoramic screen; dressing room, study corner, restrained contrasts, tenuous colours and ceilings in rare Vanilla Novasuede fabric. In the bathroom, a formal rigour of tiles, sanitary fixtures and washbasin, the latter made from a Corian print of delicate, cool dominant colour, one of the two nuances used in the yacht's various bathrooms. The galley is on the lower deck: a formidable battery of fridges, freezers, 70 cm. oven, electro-ceramic plate, sinks, work surfaces and numerous appliances ensure professional performance on long cruises. A dumbwaiter serves the two upper decks. The onboard services are completed by a day toilet and a laundry. This area also houses the crew's quarters and mess and the skipper's cabin. 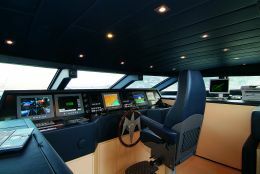 From the landing forward of the saloon you reach the lookout post and the wheelhouse: futuristic with black leather and light coloured wood , it is complete with double radar with ARPA System, GPS chart- plotter, gyrocompass, autopilot, log, echo sounding gear, wind station, VHF and SSB systems, satellite communications systems, LAN Intranet, four telecameras and the systems of control, monitoring and alarm throughout the vessel. 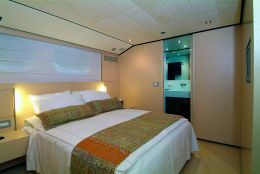 The flying bridge, which can be reached both from inside and from the cockpit, is a well equipped open air living area: circular Jacuzzi, cooking corner, dining table and obviously the bridge with the main controls and the tender on davits. The jet ski is in the forward garage and is handled by the second davit aboard. A stairway shielded in the lower part by a teak grille leads below deck to four guest cabins: two with twin beds plus foldaway and two with double beds, all with private bathroom and furnished to main deck standards. Here as elsewhere the owner's personal choices, within the two main structural bulkheads - anti-collision forward and engine room aft - decided the use to be made of the spaces: cabins, gym, study, sauna or whatever. Now Revitality is getting ready for a winter rest. Moored at the same quay, a fascinating Open and a huge motoryacht declare that they belong to the same dynasty. If in the collective imagination of Riviera people Baglietto has always meant the launching from the beach of MAS vessels, patrol-boats, flying-boats and other vessels, things have changed somewhat now. Within the framework of the new port of Varazze the yard - now part of the Camuzzi Group - has taken 240 linear metres of quay with dock and mega travel-lift: probably less romantic launching and slipping, but certainly more suited to the times. But the precious historic memory of this century and a half of activity will definitely not be forgotten: the buildings, shortly to be rehabilitated, will in fact include the new Baglietto Museum.